This holiday season, support sanctuary. 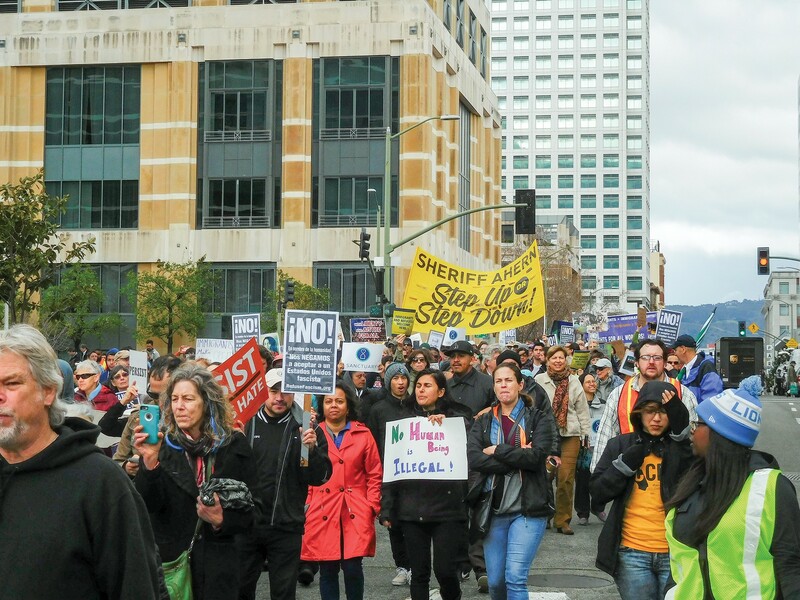 Supporters of the Alameda County United in Defense of Immigrants Rights coalition (which includes many of the organizations described in this story) marched in Oakland earlier this year to protest local law enforcement agencies that collaborate with ICE. As attacks on immigrants increase and the federal government intensifies its effort to criminalize and deport undocumented people, East Bay organizations are fighting back. Some are providing legal services to immigrants fighting deportation. Others are working to monitor federal agencies like ICE and making sure local law enforcement officers don't violate people's rights or collude with deportation agents. And other groups are combatting xenophobia and racism through educational, artistic, and cultural programming. Here are just a few of the many local groups resisting xenophobia that could use your financial support or volunteer time. Around since 1969, this Fruitvale-based nonprofit law firm provides legal services to low-income Latinos, immigrants, and other communities. Since the election of President Trump, Centro Legal has helped to organize the Alameda County Immigration Legal Education Partnership, a partnership with the Office of the Alameda County Public Defender, the Black Alliance for Just Immigration, California Immigrant Youth Justice Alliance, Causa Justa/Just Cause, the Interfaith Movement for Human Integrity, Mujeres Unidas y Activas, Oakland Community Organizations, Street Level Health Project, and Vietnamese American Community Center of the East Bay. All of these organizations together have worked to track the activities of federal immigration agents in the East Bay and, when necessary, to document arrests and provide legal services to undocumented people facing deportation. Immigrants make California a cultural, economic powerhouse, fueling the state's innovation and prosperity. This is why the California Immigrant Policy Center exists: to make sure the state's immigrant communities aren't taken advantage of by unscrupulous businesses, demonized by far-right politicians, or prevented from participating fully in civic life. In Sacramento, this organization helps advance laws and policies like SB 54, the new state sanctuary rules that will prevent numerous unjust and cruel deportations. CIPC helped ensure that immigrants can obtain drivers' licenses and has supported legislation that extended cash and food assistance programs to immigrants who are ineligible for federal welfare. Based in Berkeley, East Bay Sanctuary Covenant provides comprehensive support for refugees, asylum seekers, undocumented children, and others who have fled violence and persecution in their home countries to build a new life for themselves in the United States. The covenant helps its clients obtain legal permanent resident status by navigating the complicated U.S. immigration system. The covenant also holds regular workshops to assist immigrants with integrating into the United States. This includes programs that teach people computer literacy, basic health and safety, how to access educational resources, and English language classes. The fierce attorneys and policy experts with the Asian Law Caucus are involved in almost every fight that matters for immigrants and refugees. Over the past 45 years, they've used the law to push for better housing and schools, combat police brutality and racial profiling, expand voting rights, and fight for low-wage workers. Their attorneys have helped ensure that local and state government follow California's new sanctuary laws. And they've pushed back against the Trump administration's racist travel bans. A membership-based Latina immigrant community organization with chapters in San Francisco and Oakland's Fruitvale district, Mujeres Unidas y Activas is an organizing hub for Spanish-speaking immigrant women. The group hosts political education workshops to educate immigrants of their rights as workers and teach about the history of the domestic worker movement. It works to combat homophobia and misogyny within the Latino community and to attack institutional racism in society. Mujeres Unidas y Activas is part of numerous local coalitions addressing unjust federal immigration laws, police collaboration with ICE, and issues that affect all working families like affordable housing, tenants' rights, living-wage laws, and access to education. Oakland's Black Alliance for Just Immigration is led by African immigrants and African Americans who believe that all Black Americans must push back against racism and xenophobia. In 2017, this organization has fought for the rights of Haitian, Somali, Guinean, Liberian, and other immigrant groups across the United States. Key to BAJI's work is building solidarity between African Americans and African immigrants, and between Black Americans and other immigrants from Latin America, Asia, and beyond. Locally, BAJI's Oakland chapter carries on the work of the Black radical diaspora, which is rooted in the anti-apartheid and civil rights movements.